Price: £5.25 (incl VAT) Sorry, this item is currently unavailable. Click here to receive notification when this product comes back into stock. White Soft Paraffin B.P - Soothes and protects the skin. Soothes chapped lips and skin. Helps to prevent nappy rash and softens dry skin. Wash and dry affected area. Apply ointment gently, three times daily, using the fingertips or a piece of lint. 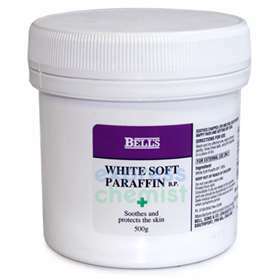 White soft paraffin B.P 100%. PLEASE BE ADVISED IF BELLS IS UNAVAILABLE A GENERIC BRAND MAY BE SENT INSTEAD. Product code: 1120526 Price: £5.25 (incl VAT) Sorry, this item is currently unavailable. Click here to receive notification when this product comes back into stock.